In this article, Custom Blinds & Designs – with convenient showrooms in Omaha and Lincoln, Nebraska (NE) – is here to talk about Designer Banded Shades for homes in Lincoln, NE. We are proud to carry Hunter Douglas window treatments, and our friendly experts can help you find the perfect style for any room in your home. Have you ever wanted complete control over every aspect of your custom window treatments? Hunter Douglas’s collection of designer shades allows you to do this. Our Designer Banded Shades are an excellent choice for anyone who wants stylish window treatments for their home, but also doesn’t want to be contained by only a few different options for customization. Contact Custom Blinds & Designs today to learn more about Designer Banded Shades for Homes in Lincoln, NE. 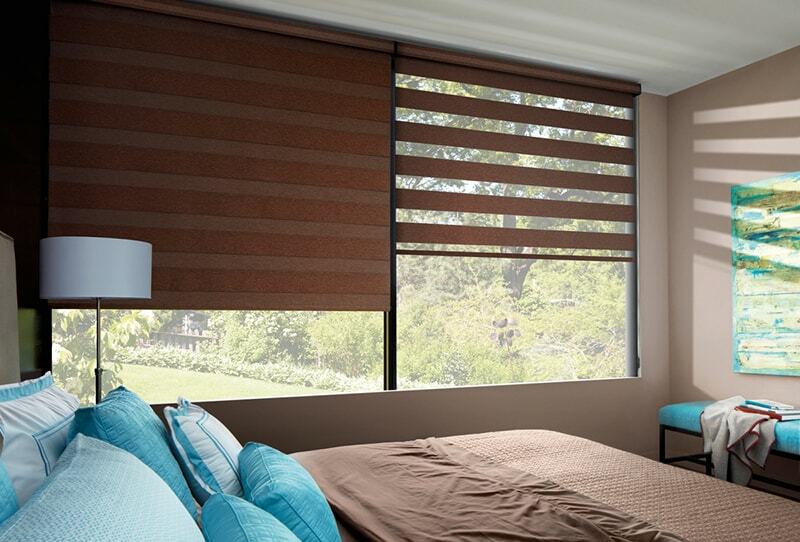 Banded shades feature alternating sheer and opaque fabric panels in one single shade. This allows you to have lots of versatility in terms of light control and privacy. You can either align the solid bands to get beautiful filtered light or you can overlap the solid panels and get tons of privacy and block out more light. What is even better about these is that they are available with your choice of operating system, including the incredible PowerView Motorization system, making it even easier to adjust your shades perfectly. When it comes to customization, you have tons and tons of options. You can choose from a variety of bold fabric colors or, perhaps, you would prefer a lighter, more neutral tone. You also have the option of three different band height, which allows for more versatility. There are even two different geometric styles. We also offer a variety of finishing touches to really complete the look. Custom Blinds and Design offers a wide variety of incredible Hunter Douglas products including the Designer Banded Shades. Whether it’s these or another amazing style, our experienced designers are here to help you find the perfect window treatments to fit your needs and preferences. We want you to be one hundred percent satisfied and confident with your purchase, so we will be there every step of the way to offer advice and answer questions. We have two locations, here in Nebraska, in both Omaha and Lincoln. We proudly serve the entire greater Omaha metro area. Give us a call today and let us know how we can help you!